Used to reduce heat in fever, headache, toothache and during hot day. Peel off the transparent film and apply the adhesive surface to the desired area. 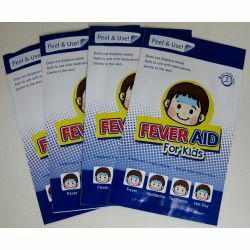 Fever Aid may be cut to a desired size using scissors. Do not use on the eyes, around the eyes, mucous membranes or skin affected by eczema, rash or wound. Stop if rashes, redness, itching or irritation occurs. For sensitive skin, consult your doctor before use. This product should be used under parental supervision when using on child while being careful that the child does not place the sheet in the mouth or cover the mouth or nose with the sheet. Wipe off perspiration or any substance on your skin as these may prevent sheet from adhering to the skin. The cooling effect of this sheet decreases gradually after opening the package. Use it immediately after opening. Use the sheets only once for efficacy, adhesiveness and hygiene. If fever persists, consult a doctor.